Home / Features / FrontPage / Now that you are single ! Now that you are single ! There is a time for everything, and a season for every activity under heaven. There is a time to be single and a time to be married. Now that you are single! This is a very important clause to reflect upon by every member of Christ Apostolic Church, worldwide, that are still single and for every child of God that is yet to be called a spouse. There is, indeed, a time to be single and fortunately for some, that is the time that you are now. Not yet married, no wife or husband now, no kids yet and family responsibilities are still in transit. What then should a single brother and a single sister be engaged in now? Look, there are so much, and I mean “so much”, to do with your life and time now that you are single than to just be asking for a life partner in preparation for marriage. It is in your “single” days that you discover God’s purpose for your life and fan same into manifestation. Now that you are single and less vulnerable to marital distraction is when you should focus on developing your capacity and competencies. Fan that God’s gifts and seeds in you into greatness now. Give yourself best to the service of God now that it is just you and you alone. Embark on building your life on solid principles and I can assure you, your days after this “single” period shall be great. These are raw truths and mind-blowing challenges that CAC LightHouse Assembly, Ikeja, Lagos exposes its singles and youths to in preparation for a greater generation of Christ Apostolic Church leaders and members in the years to come. We are pleased to welcome you on board. 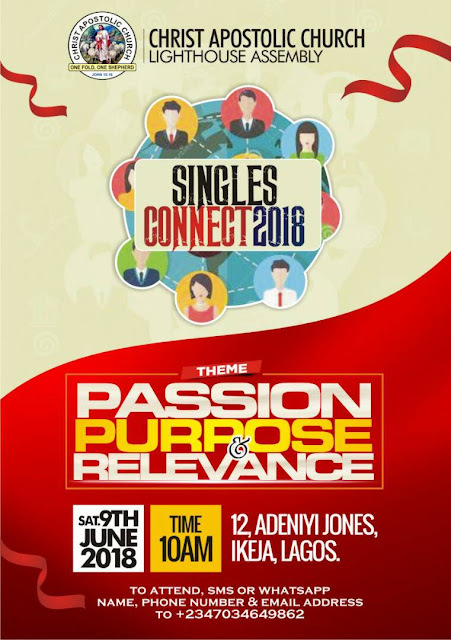 For details of our 2018 Annual Singles Connect Gathering, please contact 07034649862.